Washington, NJ: Vibrating fluid bed dryers and coolers from process equipment manufacturer The Witte Co., Washington, New Jersey (www.witte.com), are now offered with an optional pneumatic cover lift. 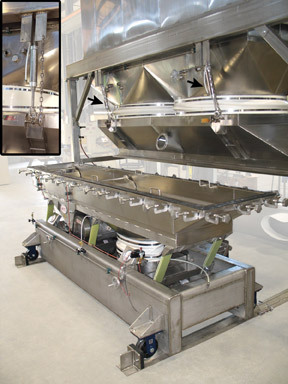 Available on the company’s fine particle drying systems that feature an integral baghouse dust collector set atop the drying zone, the new pneumatic cover lift automatically raises the dryer cover at the push of a button without any tools to allow one person to roll the dryer forward on rails out from under the dust collector. Once rolled forward, the dryer interior may be fully accessed for easy cleaning and inspection. Developed as a convenient, ergonomic way to access the dryer, the pneumatic cover lift eliminates the need for an on-site overhead crane or other costly lift system to permit dryer installation in a variety of facilities and line configurations at reduced cost. The pneumatic cover lift is manufactured at the company’s Washington, New Jersey headquarters along with the dryer, dust collector and auxiliary equipment. The pneumatic cover lift system is on display in the company’s in-house test laboratory on a full-size, vibrating fluid bed dryer for live demonstrations.